Confident Peterborough Sports manager Jimmy Dean. Peterborough Sports manager Jimmy Dean admits his mind keeps wandering off towards Wembley Way. Winning four more ties in the FA Vase would take Sports to the national stadium, the first of which takes place at United Counties Premier Division rivals Newport Pagnell Town tomorrow (January 7). Dan Banister, who misses the FA Vase game, in action in the United Counties Premier Division game between Newport Pagnell and Peterborough Sports. On paper table-topping Sports should win. The city side are seven places and 23 points ahead of Pagnell going into the tie, but Dean believes it’s one of the toughest last-32 games Sports could have received. “It’s a bit like our place, it’s a very difficult ground on which to get a result,” Dean stated. “In a previous round they beat London Colney at home which is an outstanding result. We were pleased to win 4-0 at Wembley in the last round, but Colney are top of Wembley’s league. “We played Pagnell at home and won 3-1. It was comfortable, but it was also a good, competitive game. This is a tough tie and we are preparing for exactly that. Peterborough Sports' striker Mark Jones in action against Newport Pagnell. “We don’t want to look too far ahead. but it is difficult not to think about Wembley. If we win four more ties we will be there and we are among the favourites to get there. “Some of the fancied teams have already been knocked out. There are some strong clubs still going and we are one of them. Sports, who are 12/1 to lift the Vase, should be at full strength with the exception of injury victim Dan Banister. They were denied a final warm-up game when their eagerly-anticipated city derby at Peterborough Northern Star last week (December 29) was postponed because of a frozen pitch. 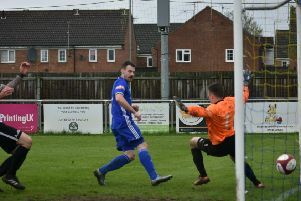 Third-placed Deeping Rangers will move to within three points of Sports if they win their top-flight match at Harborough Town on Saturday. Deeping are unbeaten in their last 19 Premier Division matches. Fourth Round: Newport Pagnell Town v Peterborough Sports. Division One South: Belper Town v Stamford, Spalding v Kidsgrove Athletic. Premier Division: Desborough Town v Holbeach United, Harborough Town v Deeping Rangers, Huntingdon Town v Cogenhoe United, Oadby Town v Peterborough Northern Star, Wisbech Town v Wellingborough Town, Yaxley v Rothwell Corinthians. Division One: Blackstones v Irchester United, Olney Town v Bourne Town. Division One: AFC Sudbury Res v March Town United, King’s Lynn Town Res v Wisbech St Mary.